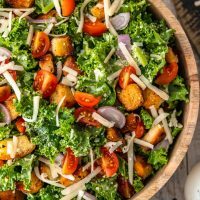 Kale Caesar Salad is the perfect side salad for any meal! It's just like a classic caesar salad, but with a twist. You've got the homemade croutons and the caesar dressing, but we're throwing in kale instead of romaine, and adding some tomatoes and shallots for extra flavor. This salad recipe is good! Coat a large frying pan with olive oil. Add in the garlic, red pepper, and salt. Heat over medium heat for 1-2 minutes or until fragrant. Toss in the cubed bread and use a wooden spoon to stir/coat the bread in the oil. Continue to fry until the bread has soaked up the oil and is golden, crisped, and browned. Remove from the heat and set aside. Add the chopped kale to a large bowl and pour in the Caesar Dressing. Massage the kale with your hands gently to soften and toss with the dressing, about 1 minute. Stir in the tomatoes, cheeses, shallots, and croutons.